The right hardscaping can make the entire pool area and your yard more visually appealing. Adding practical elements to the pool with hardscaping also makes your property more inviting. This is especially important if you enjoy entertaining family and friends. If you’re not sure which design scheme will work best for you, here are some innovative hardscaping ideas that could help you narrow down your choices. There are several stones and cement materials that create a beautiful and customized pool hardscape design. You can choose a cobblestone design, made from stones in the same color family. Alternatively, the stones can be contrasting colors for a mosaic feel. Glass or durable plastic makes great pool hardscaping as well. Once you decide on the material you want, ask your contractor about temperature control. It’s important to choose a material that keeps your feet cool during the warmer months of the year. However, you don’t want to step on substances that are too cold in the fall or winter, so a material that absorbs heat is best. You can also add customized elements to the hardscape around the pool. For instance, an outdoor fireplace positioned in the middle of chairs or benches will keep you and your loved ones warm during cool evenings. You can also have seating built into the hardscape. Innovative Hardscaping also helps to bring more attention to the pool’s structure. Stone or brick materials positioned around the pool perimeter easily make the pool the feature of the yard. You can also ask your contractor to create an opening in the pool border to lead to the spa or shallow section of the pool. If you want to include an opening in the hardscape for a plant or rock garden, ask your contractor about this. Elements like tropical plants or rocks in various sizes complement the pool water well. These features can also make the pool area look like an oasis or vacation spot. Further customizing your hardscape with designs that are special to your family is also an option. It is possible to shape granite and tile into your family monogram or crest. Building large structures around the waterfall in the pool is another way to make your hardscape one of a kind. Part of choosing the right pool hardscape design is selecting the right hardscaping companies to get the job done. The businesses you select should have the correct training and licensure. If you choose a business that has been operating for years, you’re likely to feel more secure about their services. Taking a look at the work the hardscaping company has done in the past is also helpful. When you have an idea of what to expect, you’ll feel comfortable trusting the construction team with rearranging your property. 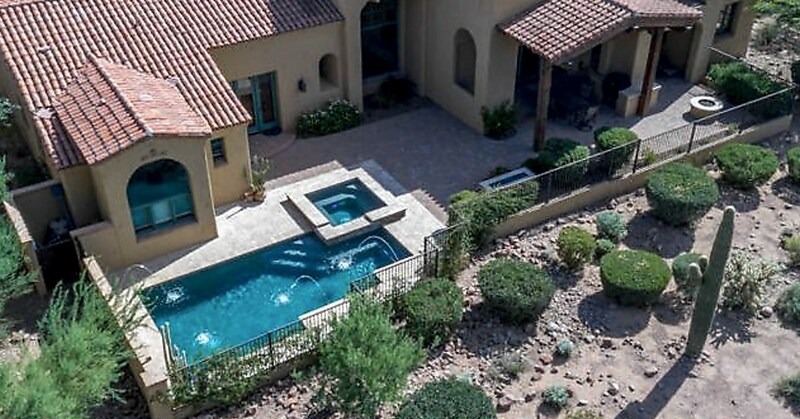 When it comes to Phoenix pool builders, No Limit Pools is among the best. The helpful, professional staff knows all about pools. Our business is family-owned, so we know how important it is making your pool safe and beautiful. Our team can also answer questions about the landscaping adjustments you’ll need to make to accommodate a new pool. Design experts will also walk you through the process of choosing the right materials of your pool hardscape, so that the finished product will fit your budget and preferences. For more details, contact No Limit Pools, your ‘go to’ Phoenix AZ pool builder servicing the area including Mesa, Chandler and Grand Canyon. This entry was posted in Hardscaping, Pool Builder, Uncategorized. Bookmark the permalink.